This large grass pitch is for a 8-berth tent size of 8 x 8 metres and includes 6amp electric hook-up. Each pitch includes one adult and one car/motorbike. We are one of the few campsites that allow campfires, we only ask to please use our onsite fire-pits, don't forget your marshmallows and toasting forks! Sacks of dry logs are available on site. This pitch is suitable for a campervan up to 6m and comes with 6amp electric hook-up. We have an adventure playground with rafts on the pond, a tree house, a zip wire, Tarzan ropes and an adventure course. We welcome campfires and have a new refurbished toilet block. NO ELECTRIC HOOK-UP WITH THIS UNIT. PLEASE SELECT ONE OF THE 'EHU' UNITS IF YOU REQUIRE POWER. This medium sized grass pitch is for a 5-berth tent size of 6 x 5 metres, each pitch includes one adult and one car/motorbike. We have an adventure playground with rafts on the pond, a tree house, a zip wire, Tarzan ropes, and an adventure course. NO ELECTRIC HOOK-UP WITH THIS UNIT. PLEASE SELECT ONE OF THE 'EHU' UNITS IF YOU REQUIRE POWER. This small grass pitch is suitable for 3-berth tents 3 x 3 metres. Each pitch price includes one adult, tent and a car. We have an adventure playground with rafts on the pond, a tree house, a zip wire, Tarzan ropes, and an adventure course. NO ELECTRIC HOOK-UP WITH THIS UNIT. PLEASE SELECT ONE OF THE 'EHU' UNITS IF YOU REQUIRE POWER. This large grass pitch is for a 8-berth tent size of 8 x 8 metres, each pitch includes one adult and one car/motorbike. We are one of the few campsites that do allow campfires – don't forget your marshmallows and toasting forks! Sacks of dry logs are available on site. NO ELECTRIC HOOK-UP WITH THIS UNIT. PLEASE SELECT ONE OF THE 'EHU' UNITS IF YOU REQUIRE POWER. A pitch suitable for a motorhome up to 7½ metres. We have an adventure playground with rafts on the pond, a tree house, a zip wire, Tarzan ropes, and an adventure course. We are one of the few campsites that do allow campfires – don't forget your marshmallows! NO ELECTRIC HOOK-UP WITH THIS UNIT. PLEASE SELECT ONE OF THE 'EHU' UNITS IF YOU REQUIRE POWER. This pitch is suitable for a campervan up to 6m. We have an adventure playground with rafts on the pond, a tree house, a zip wire, Tarzan ropes and an adventure course. We welcome campfires and have a new refurbished toilet block. NO ELECTRIC HOOK-UP WITH THIS UNIT. PLEASE SELECT ONE OF THE 'EHU' UNITS IF YOU REQUIRE POWER. Our backpacker pitch is only available for any persons travelling to the campsite by foot, train or bike. We have an adventure playground with rafts on the pond, a tree house, a zip wire, Tarzan ropes, and an adventure course. We are one of the few campsites that do allow campfires. This is a great site for kids. It ticks all their campsite boxes and probably a few more besides. Campfires are not only allowed, but positively encouraged in selected areas, with bags of logs complete with kindling and firelighters sold onsite each evening. The first thing that meets you on arrival is the pond, fed by a stream and usually full of children paddling and playing on tyre rafts – it makes a perfect focal point for kids to get to know each other. The playground has everything your young outward-bounder desires in the way of zip wires, climbing frames, tyre rope-swings and adventure courses. 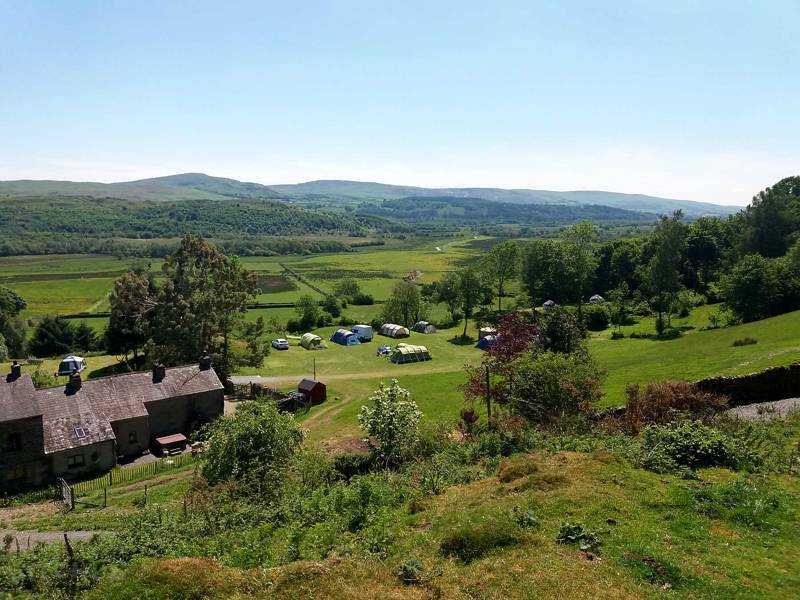 And there’s an added extra: the site sits along the route of the Ravenglass and Eskdale steam railway line – an enchanting and atmospheric way to arrive if you’re coming by public transport. So if you’ve walked into the nearby hamlet of Boot and there are some tired little legs as a result, hop on board for a scenic choo-choo trip back to camp. 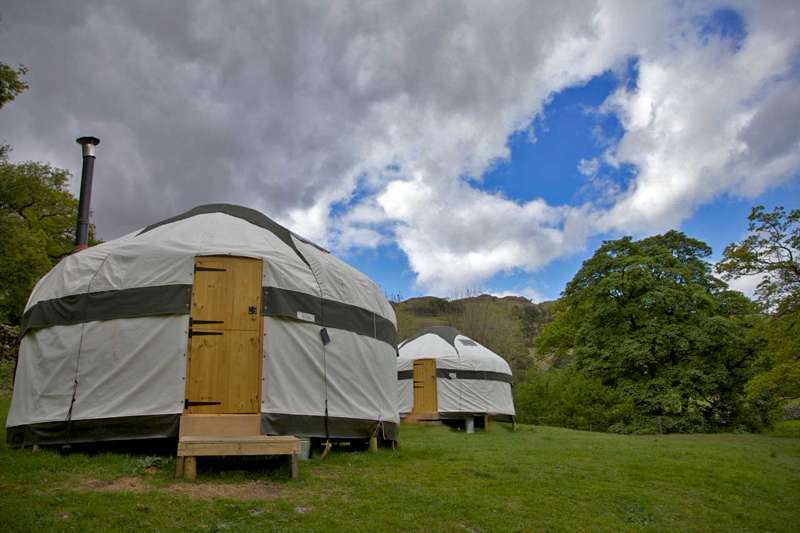 For the adults, the site is in the heart of the Eskdale valley, a quieter part of the Lake District, far from the busier eastern realms near the M6. It's also a spot that neatly combines access to England's underrated North West coast – a myriad of beaches, marshes and tidal inlets that's exemplified by Ravenglass at the other end of the railway line – and the very highest peaks in the national park. Scafell Pike, the highest mountain in England, is within hiking distance for those who really want a challenge. Back at camp, there's an evening quiet time and a pleasing, respectful sense of calm come bed time. rugged, bracken-clad fells, woods and grazing sheep provide a splendid backdrop to rest your eyes on when you do eventually find time to relax. Sometimes, putting the feet up can be as important as putting the hiking shoes on. 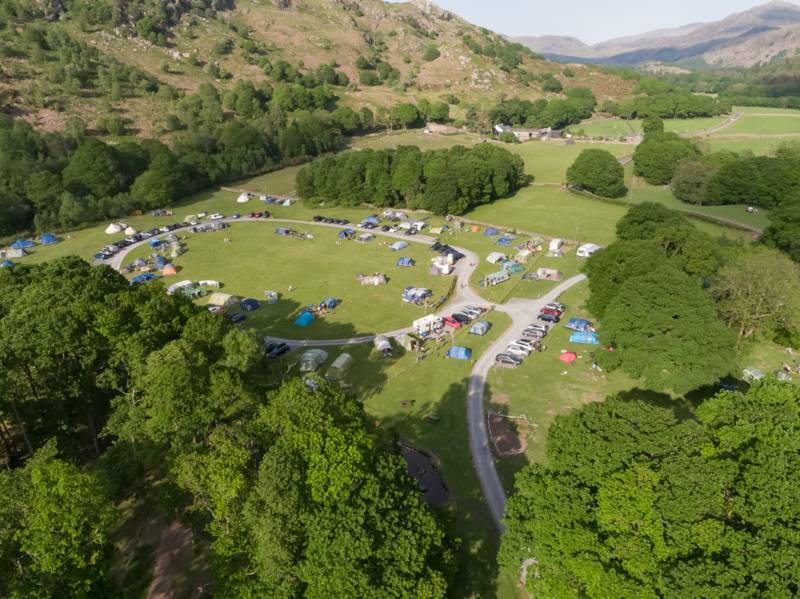 Fisherground is set in Eskdale, a spectacular valley on the western side of the Lake District, a quiet and peaceful spot that welcomes families and walkers. 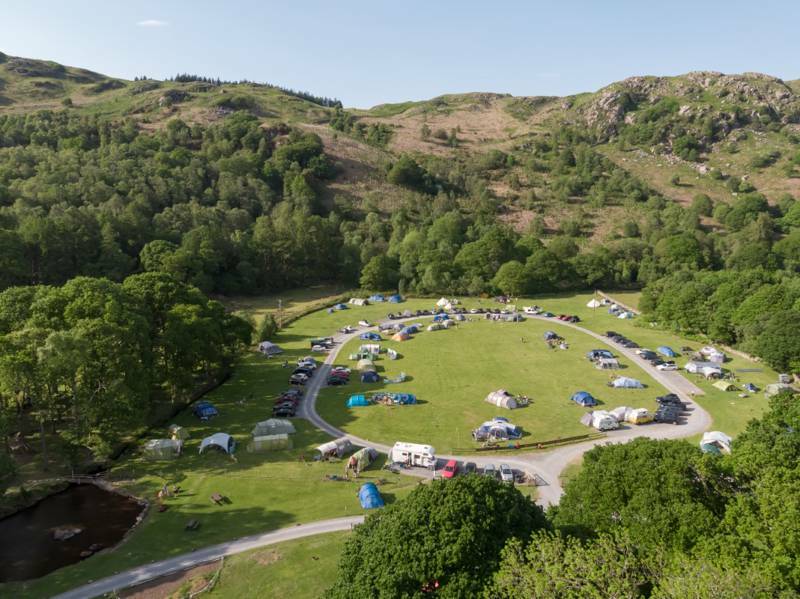 We've been voted in the Top 18 of the '50 World Best Campsites' chosen by the Independent Newspaper. We have rafts on the pond, a tree house, zip wire, Tarzan ropes, and an adventure course, all of which helped to place us Top 4 in the 'Children's Enjoyment' sub-category. 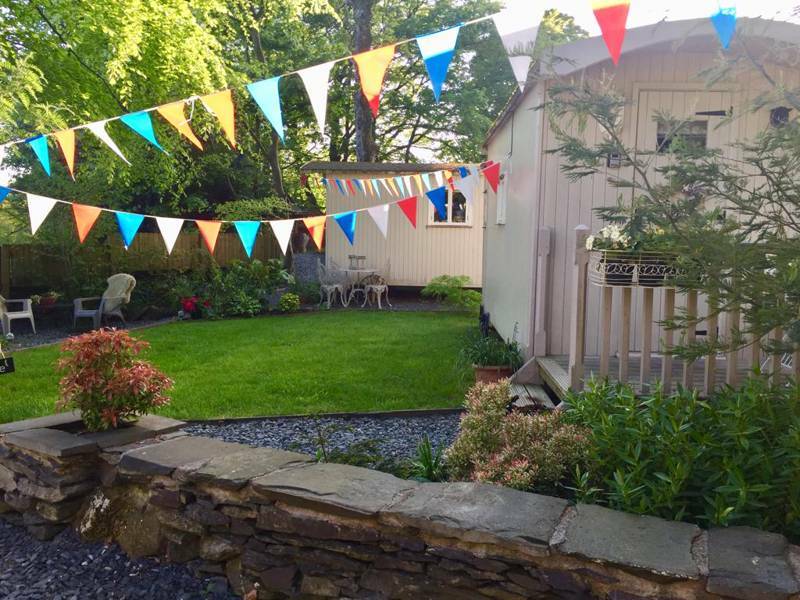 Pitch up in our peaceful spot and enjoy a relaxing break at our scenic site. 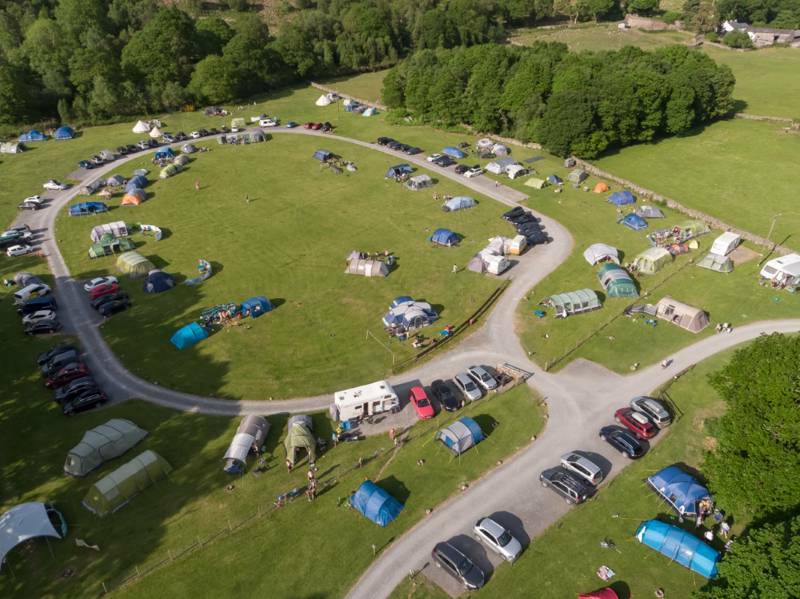 For latest availability and best prices for Fisherground Campsite, please use the Date Search above. Unmarked pitches in 2 main areas: a larger field nearest to the children’s playground, and a smaller, quieter field nearest to the toilet/shower block, with wheel rims for campfires. The recently refurbished toilet block has ample hand basins, showers (50p-coin operated), and loos; all clean and well-kept. There is a washing machine, 3 tumbledryers, a boot-dryer and freezer. 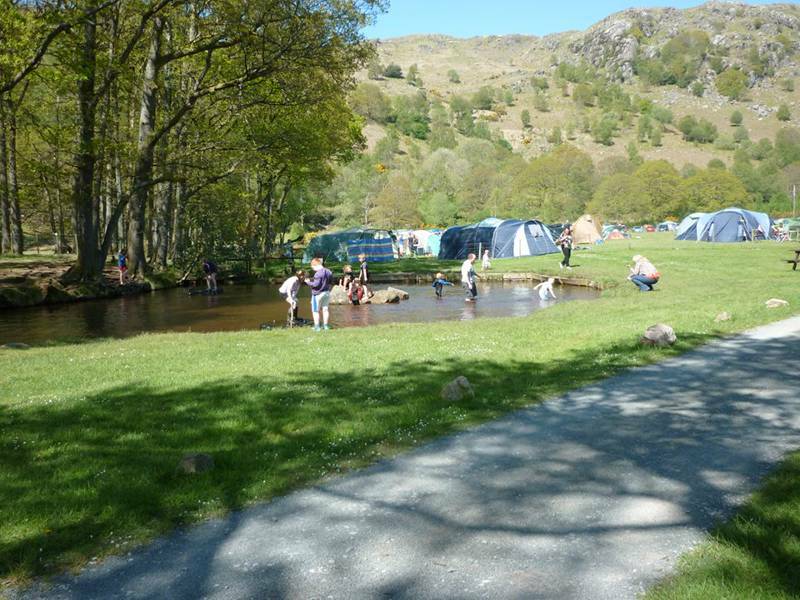 The kids will be straight into the pond, rain or shine, before you’ve had a chance to even pitch your tent. As well as the playground and pond, there are rocks and trees for climbing on and plenty of space for ball games – there’s a field next door for bigger games. No shop onsite, but you can buy logs, kindling and firelighters. Noise after 10.30pm is not allowed. If you want to get out of the rain, take a tour of Eskdale Mill in Boot (01946 723335), one of the few remaining 2-wheel water corn mills. The mill also has a small honesty library. Marshmallow-toasting? Check. Water? Check. Playgrounds? Check. Trains? Check – all the the things that make camping really cool for kids. And you can even arrive at the site's own station by steam locomotive. Go by steam train to Ravenglass (01229 717171), or make the short trip to Dalegarth. From here you can walk into Boot or up to Stanley Force, following the tumbling beck up to the waterfall. A short walk towards Eskdale Green takes you along the River Esk, where a shallow area by the bridge is a good spot for a quick, if chilly, dip. There are 100's of good walks near to the site – from lower level rambles to Munster Castle (about a 3hr round trip; 01229 717614), to challenging all-day hikes up Scafell Pike, England's highest peak – or bring your bike along. 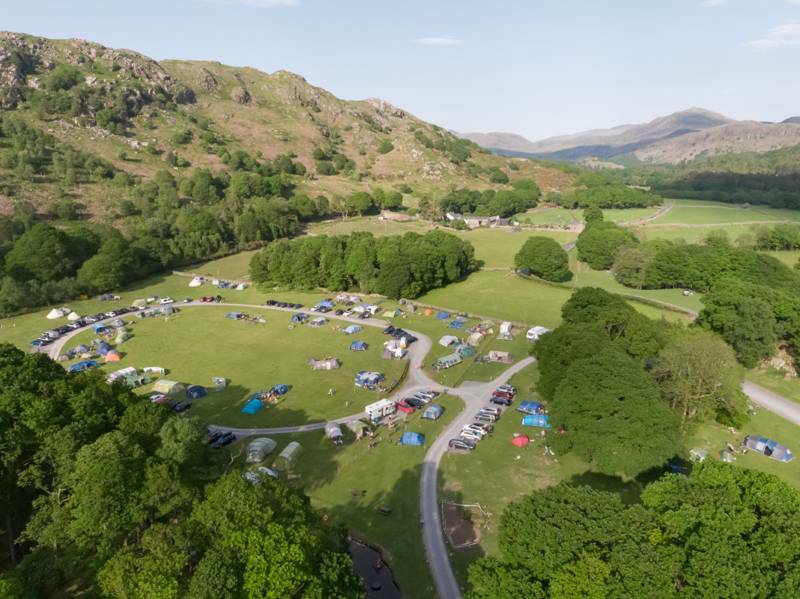 Eskdale Green is the closest village, where there's a small store selling all the food and essentials needed for a camping trip – they even sell waterproofs. The shop is within easy driving distance (5 minute's by car). There are options galore in the area for a good meal and a thirst-quenching pint, with four places less than 2 miles away. The Brook House Inn (01946 723288) is closest – just a 10 minute walk away – and features a varied menu (with classics such as beef pie and Cumberland sausage with mash), not to mention 180 whiskies on offer to try! They serve a range of real ales, such as local ale Langdale, Hawkshead Windermere pale and a range of guest beers. Jut a couple of minutes further along is the Boot Inn (01946 723711), a traditional place offering home-cooked food and stunning views. Try their minted lamb Henry or gammon steak. The King George IV Inn (01946 723470) and The Woolpack (01946 723230) are also worthy options. Slightly further afield lie Italian The Wild Olive (01946 725 999) and the Bower House (01946 723 244), a dog-friendly watering hole with a beer garden. 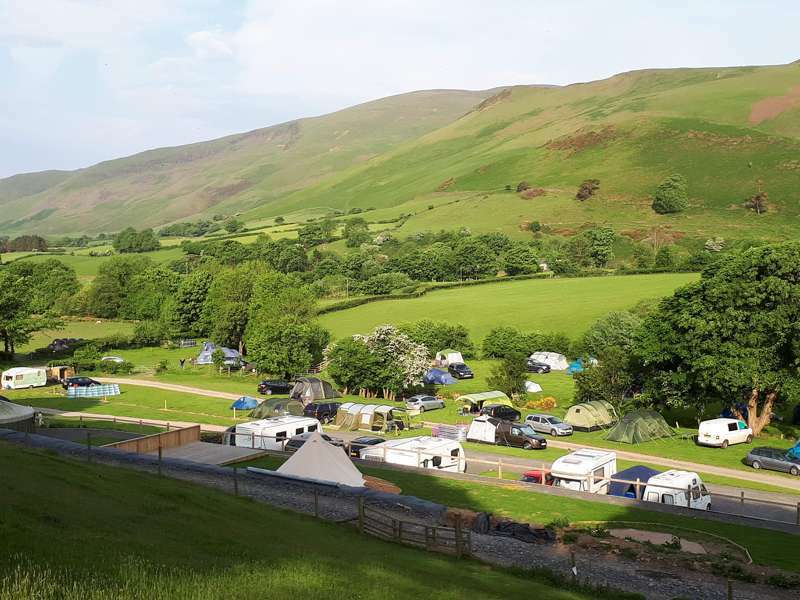 Tent pitches from £12–£18.50 per night (depending on tent size and season). All tent pitches include 1 adult, car/motorbike and tent. Extra adults £8 per night, extra children (3–16 yrs) £4 per night, under-3s free. Dogs £2 per night (max 2 per pitch). Campervans from £14 per night. Backpacker pitches for those arriving on foot, by train or by bike from £10 per night. From the south, leave the M6 at junction 36 and follow signs for Barrow, then 3 miles past Newby Bridge turn right towards Workington on the A5092. Keep on this road for around 10 miles, then beyond Broughton-in- Furness, turn right at traffic lights towards Ulpha. Turn left in Ulpha village to the steep hill signed ‘Eskdale’, follow the fell road to the King George IV pub and turn right to Boot. The campsite is 300 metres on the left. From the north, leave the M6 at junction 43 towards Workington/Cockermouth on the A595 then turn onto the A5086 to Cleator Moor and Egremont. Rejoin the A595, passing Egremont and Gosforth and driving through Holmrook. Turn left after the garage to Eskdale Green, follow the road to the next junction and turn right, then go through Eskdale village to the King George IV pub and turn left to Boot. Beware of using Sat Nav if you want to avoid taking the white-knuckle ride over Hardknott and Wrynose Passes! A 618 bus (0871 200 2233) from Ambleside and Windermere stops at Fell Foot around 5 times a day.